... to this country today and the days ahead only God knows (or should I let Superman take in charge.) Gibo, my president did not make it, just as he conceded to Noynoy, I too should accept the fact that, what I believe the supposed to be the most capable presidentiable of all (minus GMA) lost his chance to reform the educational system of this country. I hope the young Aquino should also find in his heart the setting of priority to this left-out institution of this society. It is my prayer that this country’s future will not be as gloomy as sky set above the color that represents this beloved country of mine. I hold good thoughts for you and your country. Hopefully the future will be as good as the beautiful blue skies you have posted! May your weekend go well! that bluish hue is really becoming. Great shot. I wish you and your country gret feature. We all h0pe,pers0nally I d0n't want p0litics...we can 0nly h0pe and pray for the better,i really h0pe s0,tsk,tsk,tsk lol! A most relevant photo for this time, and the blue of the sky is so gorgeous! Great capture of the gloomy sky, Vernz. Don't worry Vernz, it is only the beginning for our President Gibo. And I hope our new President could make our country a much better place to live in. very nice kaayo ang pagkakuha ate vernz! That's super blue sky, Vernz. Happy weekend! I am also for Gibo, sad he didnt make it. I hope Noy will be a a good president. Gibo should have been better. 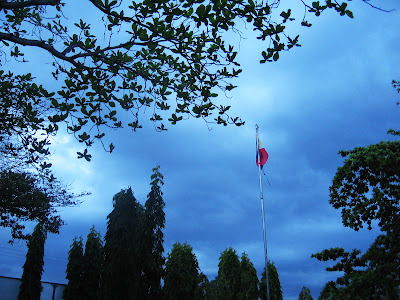 Nice shot of the Philippine flag! Bravo Filipino! Sadly he didn't make it, I hope the majority of the voters made the right decision.